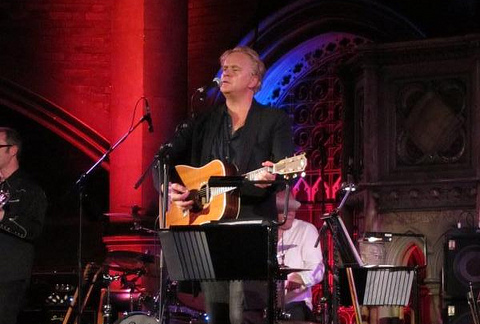 Last night we headed down, yet again, to the Union Chapel in Islington. This time, we weren’t checking out beardedly soulful singers of Americana, or disgracefully growing old Welsh crooners – we were there to see the transition of a fine screen actor into a card carrying musician. Whether it is the post-divorce mid-life crisis tour, or the ultimate fulfilment of a childhood dream, Tim Robbins and his band put on an admirable show, with an excellent, but way too short, support slot from Kami Thompson. Looking suave in a long coat, his grey white hair slicked back atop his child-like face, Robbins strode out onto the stage with his extensive band. His expression was a mix of nervousness and joy throughout the set, and that showed itself in his songs – with a set-list that seemed more ‘favourite songs on random’ than careful curation, veering between his own songs and covers. The Chapel was nowhere near full capacity, with the top balconies closed off and seats still free in the venue, perhaps it was a bit too brave to try a small medium sized venue at this point in a career, but those people who were there enjoyed the show to its full. The highlight of the show came too early, with a singalong to an old blues gospel staple that had the audience grinning gleefully. This energy carried Robbins through the next few songs, but at some point that seemed to desert him and the set peetered out rather than ending with a bang. With the encore, ending a song earlier would have helped us leave on a high – but these are all tricks that Robbins will likely learn as he faces more real audiences, as well as finding which songs his voice carries best. Camp Billie Holiday covers may not be an ideal to strive for, Johnny Cash was a good fit with some great harmonica and Tom Waits.. well, you need Tom’s voice as Scarlett Johansson already proved. Overall, an interesting night but more ‘watch this space’ than a gig that everyone will rue missing. Either way, you have to give Tim credit for following a childhood dream with such gusto and obvious joy. Bless you, sir.